While seeing projects completed safely and to the satisfaction of our clients is award enough, for DST awards and honours are testaments to our time proven capabilities and continued excellence in delivering outstanding consulting services. DST was honoured to win the 2018 CEO Award of Merit in the Project Management category. This award recognized excellence in consulting engineering for the Deconstruction of 880 Bay, Toronto. This project had clear goals from the beginning: deconstruct the outdated structure at 880 Bay in a manner that was safe, non-disruptive to Toronto’s busy downtown, but with clear emphasis on sustainability. Thanks to the entire team’s commitment to excellence and the Client’s vision, this project achieved an aggressive waste diversion target of 96% and surpassed industry standards for health and safety. We extend our sincerest congratulations to the entire team including the Client Infrastructure Ontario and expert demolition contractor Priestly Demolition Inc. (PDI). Working with them on this project was a pleasure and this award is ours to share. Lastly, thank you to the Consulting Engineers of Ontario for recognizing our hard work with this great honour. We are extremely proud of the DST team for this outstanding accomplishment. DST’s Micheline Gervais, Project Manager and Jr. Associate working with the Sudbury team, is the recipient of the 2017 Influential Women of Ontario Award for Tradeswoman of the Year. This award is presented annually to a woman who excels in a non-traditional career, someone who is respected by her peers and coworkers, and who shows passion for her work. Anyone who has had the pleasure of working with Micheline knows she is all of this and more. She is truly deserving of this recognition. We are extremely proud of Micheline for her accomplishments. DST was honoured to win the 2017 CEO Award of Merit in the Environment category. This award recognized excellence in consulting engineering for the “Natural Waterfall as a Green Solution to Stormwater Management for Wateridge Village” project. The innovative waterfall concept combined robust engineered features with a low-impact design that was less intrusive on the surrounding landscape than traditional methods. DST and Ecosuperior Environmental Programs were honoured with the RBC Innovation Award for Project of the Year. This award recognizes the innovative, specialized sampling, in-situ testing and laboratory testing techniques developed by DST in order to accurately characterize the extremely soft sediments present in the Thunder Bay North Harbour (TBNH). 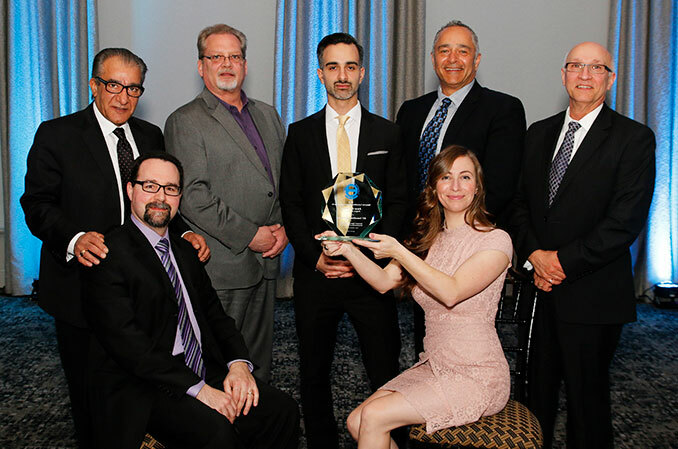 DST was honoured with the Northern Ontario Business Award for Innovation for providing Northern Ontario with Alternative and Innovative Geotechnical Solutions. DST was honoured to have received the CEO Award of Excellence for Environmentally Friendly Slope Stabilization. DST was honoured to have received the CEO Award of Excellence for Environmentally Friendly Ground Improvement Works. DST was honoured to have received the Northern Ontario Business Award for Company of the Year in 2006. DST was honoured to have received the Northern Ontario Business Award for Business Excellence in 2003. DST was recognized with the Northern Ontario Business Award for Company of the Year in 1995.